Stretch marks are problem that affects 70% of women and up to 40% of men. As a result of the elastin and collagen disorders, cavities occur in the skin. They are normally in the form of unaesthetic stripes. Most often they appear on the stomach, breasts, hips and buttocks. The exact mechanism of the stretch marks formation is unknown. Although it is known that an important role in their formation is played by genetic factors as well as fluctuations in the body weight and hormone levels. They often affect pregnant women. So far, the stretch marks have had to be accepted – even the most popular methods have not brought the desired effect. Currently, both fresh and atrophic stretch marks can be effectively removed without much interference in the body by using aesthetic dermatology which effects can be seen after the first treatment. This is a non-surgical, safe and the most natural lifting treatment. 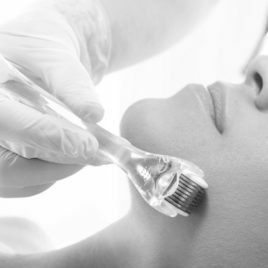 Interruption of the bonds between the epidermal cells in the upper layers of the skin causes dermabrasion effect, making the skin smoother and more radiant.